The card shop is your place to go to buy trading cards. You can select to buy either 1, 3 or 5 standard booster packs. You receive a rebate when you buy more than one. 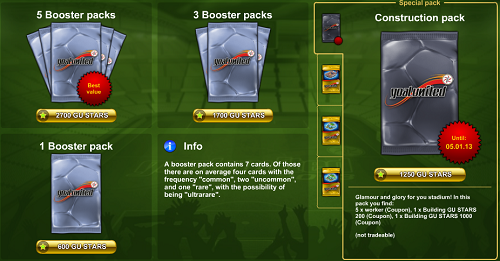 On the right side you find the special booster packs that are currently available. Those boosters contain cards specifically for a certain aspect of the game for a slightly reduced price. By clicking through the tabs you can find all available special packs, for example for licenced items, top team matches and building upgrades. Standard booster packs contain 7 random cards, of those there are on average four cards with the frequency common, two uncommon, and one rare, with the possibility of being ultrarare. On the top you can switch to a tap to view your unopened packs, you open them with a click on the logo. To buy cards select the package you would like to buy, then click on next on the right side and follow the steps. The cards are then added to your card deck.